Gregory has quite an imagination which he uses while drawing pictures. In class, they are to draw a still life of a flower vase. Gregory gets carried away, and his vase becomes a spaceship. Gregory thinks he will get in trouble for his drawing, but the teacher loves it and puts it up in the classroom. 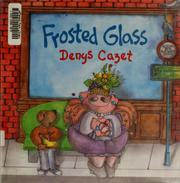 Cazet, Denys, “Frosted glass,” Children's Picture Book Database at Miami University, accessed April 24, 2019, https://dlp.lib.miamioh.edu/picturebook/items/show/7119.